"[T]the world map in the Rudimentum emphasizes the inhabited lands and pictures them as a circle surrounded by an ocean sea. Inland waters divide the ecumene into the three usual continents, each of which is labeled on the Lubeck map: Asia at the top, with the lettering outside of the circle while Europe and Africa have their names given just below the diameter where Asia ends. Paradise is located in the far east, with the four rivers issuing forth from the Garden of Eden and flowing through the lands of the earth. 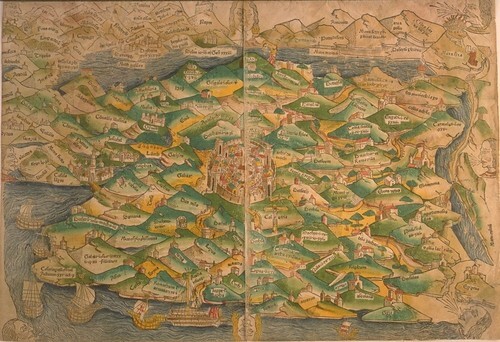 The Holy Land is in the center of the map with the Pillars of Hercules at the bottom. The map seems to focus on the large continental divisions rather than on the exact geographical relationship between places. Thus the cartographer wanted the readers to know that Alexandria was in Africa, Persia was in Asia, and Venice belonged to Europe, rather than to give the precise location of each place. The placement of countries within their respective division of the world often seems to be based on other factors than distance and direction. Thus Rome is placed near the center of Europe, and Carthage occupies the similar position of honor in Africa. 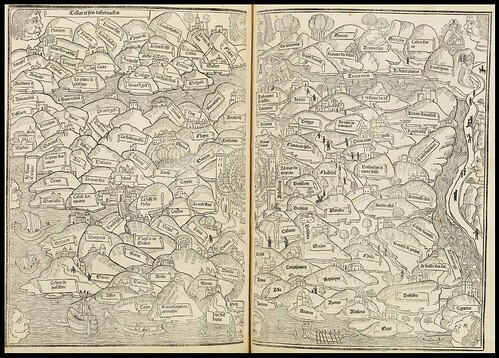 Holy Land maps of 1491 and (I think) 1475 respectively. AND plundering of a castle. 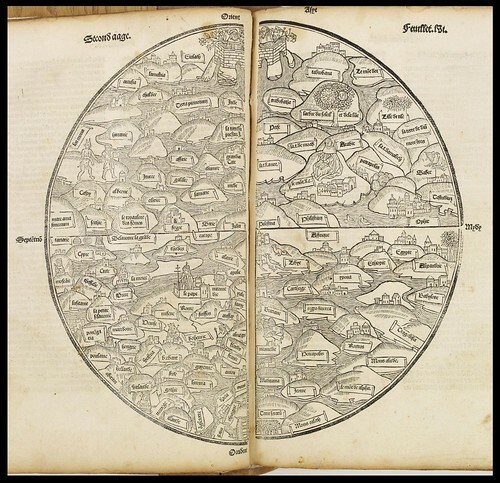 'Rudimentum Novitiorum' (Handbook for Beginners) was first published in Lübeck in 1475. It is an encyclopaedic world history based on medieval theology "derived from the Bible, the Church Fathers, pagan mythology and compilations such as that of Vincent of Beauvais, offering the basics of historical knowledge to young clerics. For the chronological arrangement use has been made of genealogical charts which are illustrated with portraits and scenes, including the first printed map of the world." 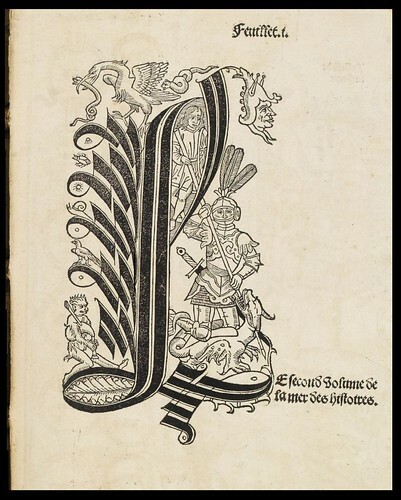 The author of the original incunabulum remains anonymous and the work achieved a wider popularity after it was translated into French (as: 'La Mer des Histoires'; The Sea of Stories) and published by Pierre Le Rouge and Guillaume le Bret in 1488/1491. 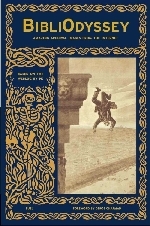 Seven subsequent folio editions were released before 1555. The eccentric presentation of religious and mythological history combined with geographical relationships of varying accuracy and importance in a visual format make these medieval maps particularly fascinating. It is well worth looking closely either in the large format (click on the images above) or via the zoom interface as below. The two black and white maps, figural lettrine and Noah genealogy illustrations were all spliced together from up to twenty five screencaps each (spot cleaned a little). Unfortunately there doesn't appear to be any other illustrations from these exceedingly rare incunabula available online. The images come from the Paulus Swaen map site via Map History. Information from Newberry Library, (image 3). 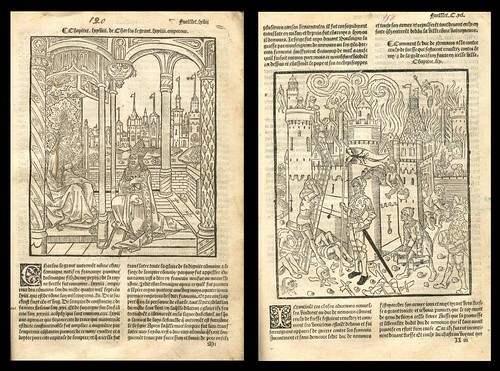 The woodcuts featuring Charlemagne and the castle are from Oldmasterprint. The colour map of the Holy Land is from the University of Maine (number 10). The idea of representating all the cities and such as individual hills is oddly fetching (but why???). There's also something almost archetypally elegant about the knights and decorations, as if all those 19th and 20th-century illustrators of King Arthur and the like were inspired by these particular knights and castles and dragons. I mean, there are images I find more beautiful (for example the Tres Riches Heures) but that don't have that same tug of "that's just how I always thought it should look." I recently read Mary Carruthers’ book The Craft of Thought in which she has some interesting comments on early mediaeval map-making, suggesting that, despite their objective inaccuracy, they nevertheless had great utility as aides-mémoires, objects of meditation, & as prompts for rhetorical invention. misteraitch, there's a long review of that book here. 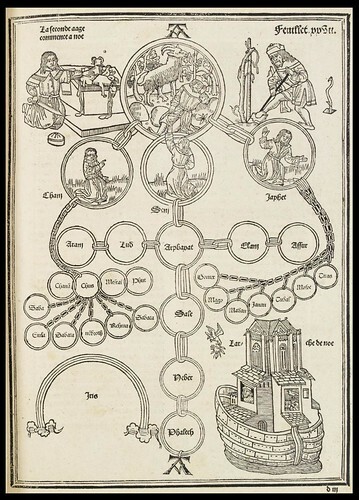 "..the well-known architectural picture known as the "plan of St. Gall" is not simply a map, but a "meditation machine.."
It sounded fairly heavy to be honest, although fascinating. It's oddly fetching Karla because it was the first stab at a topological map perhaps? Crude or unsophisticated (ie. knights) drawing has a quaintness that's attractive....sometimes. Actually, I retract the 'crude' and 'unsophisticated', particularly with respect to the knight drawings (although they apply to the maps). They are neither of those things really. You're right about archetypes too I think. They have just the right level of detail that suggest the forms we know as cliches from other media. PK—that review is heavier going than the book, which, though hardly lightweight, is very well-written. I’d likewise recommend Carruthers’ earlier The Book of Memory too. Yeah, I wouldn't have called them "crude or unsophisticated." Maybe just the right degree of detail for the style, and nicely balanced? It's my understanding that many paintings and book illustrations were intended in part as aids to meditation. This isn't quite my area but I think it was common for prayer. And once upon a time I did a class paper looking at Breughel's paintings of the seasons in terms of journeying through the scene (Patinir's paintings seemed to do that a bit more obviously). Re memory, of course there's Frances Yates's Art of Memory (re using images to recall complex material) although I think she dealt with mental images rather than those in front of us (I didn't have time to read very far in the book, so may have missed discussion of physical images).